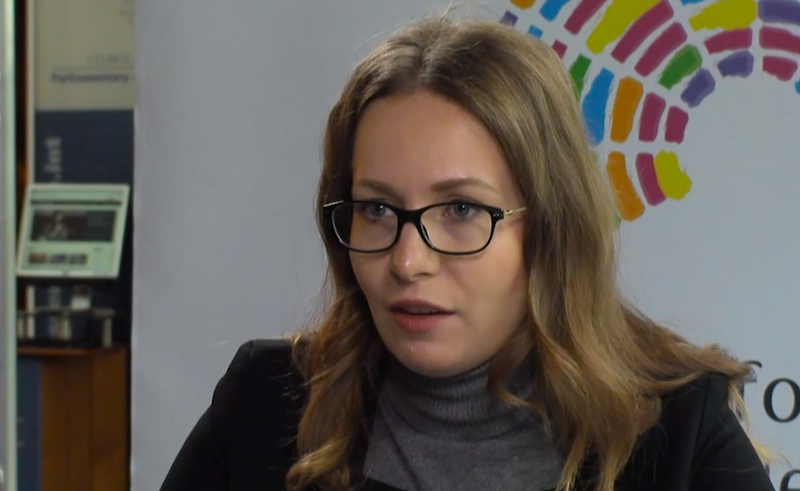 Women are widely stereotyped in the Ukrainian media as financially dependent, “beautiful dolls” or merely “someone’s wife or daughter”, said Oleksandra Golub, who heads the NGO women’s rights protection league. Meanwhile, men are presented as unable to “take care of the family, or deal with children”. Golub was one of hundreds of international speakers at the 2018 World Forum for Democracy at the Council of Europe in Strasbourg, France. The theme of that event, in November, was “Gender Equality: Whose Battle?” with Golub's session asking Can stereotypes against women be banned from the media? Earlier that month, Christian conservative media-makers gathered in Kyiv, Ukraine for the Novomedia forum. There, delegates discussed using the media to promote ultra-conservative ideas and gender roles to the exclusion of LGBT and other relationships that don’t conform to their vision of “traditional families”. “We fight against these ideas, and try to create a space for freedom, where everyone could be themselves”, Golub told me, describing gender stereotypes, and rigid gender roles on TV, in magazines and advertisements as contributing “not only [to] inequality, but also for tolerance of gender-based violence”. “Everyday we see a lot of violence in our screens, on the media, and of course it influences the behaviour of people”, she added, referencing high levels of gender-based violence in Ukraine alongside a gender pay gap of about 27%. The percentage of women in parliament meanwhile stands at just 12%. Golub is convinced that this low share of women participating in political institutions is influenced by sexist messages transmitted by the Ukrainian media daily. “Even voters during an election process have stereotypes of women’s roles, that women can't be good politicians”, the activist explained. When the media does interview a woman politician, they tend to show more interest in her clothes or husband, than her legislative proposals, she added. High-profile, national politicians have also repeated such stereotypes. For instance, in 2010 Ukraine’s then newly-elected prime minister Mykola Azarov stated that conducting reforms in the country “was not women’s business”. The former Ukrainian prime minister Mykola Azarov stated that conducting reforms in the country “was not a women’s business”. Golub’s organisation engages directly with media groups, parliament, governmental agencies and others to raise awareness about sexist content in the media and in statements by public figures. On paper, Ukraine’s 1996 advertising law explicitly prohibits advertisements that contain “statements which are discriminatory” on grounds including gender. Despite this, Golub’s NGO says that Ukrainian ads are full of objectifying and eroticising images of women and harmful gender stereotypes. To challenge this, in 2017 it launched a new campaign “Ukraine without sexism”. As part of this campaign, it's published descriptions of sexist content to help people to identify such messages. It also encourages the Ukrainian public to report sexist advertising to the women’s rights protection league. The group checks reports, publishes them on its Facebook page, and notifies government agencies to investigate potential violations of the advertising law. If these agencies agree that content is sexist, the companies responsible for it must remove it and face (small) fines. In the first year of the campaign, Golub’s organisation sent more than 400 complaints to the government, which ruled that just 20 were discriminatory. They also supported amendments to advertising laws to reinforce the regulation of sexist content – and the improvement of procedures by Ukraine’s ministry of social policy for imposing fines for violations of advertising law. While Golub described some progress within public agencies, she sometimes faces heated talks with companies who don't understand objections to their content. It’s easier, she said, to produce sexist ads than high quality material. Though, she described “one of the lawyers of a big advertisement company” who didn’t understand these complaints until the NGO explained them. In such cases, she believes they’ve “really changed minds of people” in the industry. A year later, Golub said, she saw this lawyer commenting on another sexist ad on Facebook, saying: “Guys, don't do that, because it is prohibited by law”. Golub told me that tackling gender stereotypes in the media is important for Ukrainian democracy. However, equality cannot be achieved by legislation alone, she said, and must come from “an everyday respect for women”. * 50.50 reported on these events in Strasbourg as part of openDemocracy’s partnership with the 2018 World Forum for Democracy.